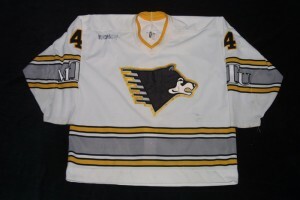 The 1993-94 hockey team debuted that logo on a set of white Bauer jerseys with “MTU” on the elbows and a multi-color collar. They were worn throughout that season including the GLI tourney, where I believe the included game photo was taken. However for some reason, they were only used one season. The following season the team received new white Bauer jerseys of a slightly different design (which again only lasted one year). 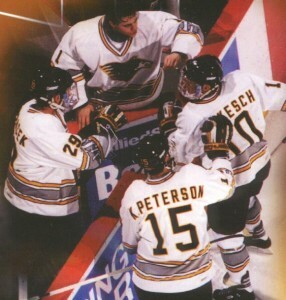 The 1994-95 jerseys were nearly identical, but could be distinguished by their white & gold collars. Over the years I have collected nearly every variation of jersey worn by the Huskies Hockey team from the 1980s to present, but those 1993-94 jerseys never surfaced. I have not seen one physically or in print since that season ended. I was a member of the Pep Band during those years and I remember the Pep Band and Blue Line Club raffled off a lot of used jerseys at home games to support the Huskies back then, so I am surprised that they remain out of sight. If these mystery jerseys are out there, I would love to add one to my Huskies Hockey collection. But honestly, I would be interested just to see photos of one and know the story behind what happened to them after that season. 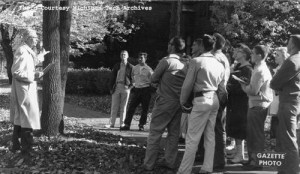 I am guessing the photo is a biology or ecology class and I think the prof at the left of the picture looks like Bob Janke. I don’t think they are foresters—no jeans or logger boots! Sometime in the 90’s or later? Re Dr. Janis Inveiss inquiry in the April 12th newsletter. Dr. Inveiss was a professor in Mechanical Engineering. He taught me Thermodynamics and Internal Combustion engines in 1956-57. I have to say that he was one of the best professors I ever had at Tech, in spite of the difficulty in understanding his lectures. He spoke in a horrible broken accent, but the material was presented with great clarity. Dr. Inveiss was Latvian, and he was sent to a German concentration camp during the latter stages of WW2. Latvia ended up in Russian control after the war, but somehow he was resettled to the USA by the Lutheran Church and ended up in Milwaukee. An interesting article in the Milwaukee newspaper featured him as a church janitor in 1949. He was having a hard time finding employment as an engineer because his English was so poor. I don’t know how Tech got him on the faculty, but a generation of Tech ME’s greatly benefitted from him being there. The article is actually outdated because NASCAR crew changes happen so rapidly. Greg is in his second year as Dale Earnhardt Jr.’s crew chief. This is a highly visible position obviously because of Junior’s popularity among fans (consistently voted most popular driver). Junior had his best year in a while last season and is starting off very strong this year. A lot of that has to do with how well the two of them communicate about the car’s performance. I now have a reason to root for Junior to succeed!